Evergreen succulents with a profusion of bright daisy flowers. Easy to grow, colourful, tough, hardy 'Jewel of Desert' succulent Ice Plants. Finely-petalled , succulent daisies producing a nearly non-stop display from spring through summer. Plant the coloured jewel-like flowers in a sunny spot in pots, borders or rockeries. In a mix of Orange, Yellow and Violet, each with a distinctive white centre. Supplied as 3 x 9cm plants - 1 each of 3 colours. We are delighted to offer you a real breeding breakthrough - the gorgeous series of 'Delosperma Jewel of Desert' Hardy Ice Plants. The result of 15 years breeding by a Japanese enthusiast, these little gems sparkle all summer long - but are both incredibly drought tolerant. and yet hardy too! Most people probably have not heard of Delosperma, but they are close relations of other trailing succulent types like commonly known succulents Mesembryanthemum, and the borderline hardy Lampranthus often seen on dry stone walls in Cornwall and the South West. The new 'Jewel of Desert' series all have a distinctive white ring around the centre of their profuse flowers, giving them a completely new look too, sitting tight into their succulent, blue-green foliage. The flowers will smother established plants all summer long. They love being baked warm and dry in our summer sun, and conversely hate wet feet in winter so we suggest growing them in pots, in well-drained soil with added grit and sand. They will spread to cover the pots, and trail down over the side. They also work well in very dry banks and stone wall crevices, as this new series are totally hardy too, and make a superb addition to traditional alpine gardens. 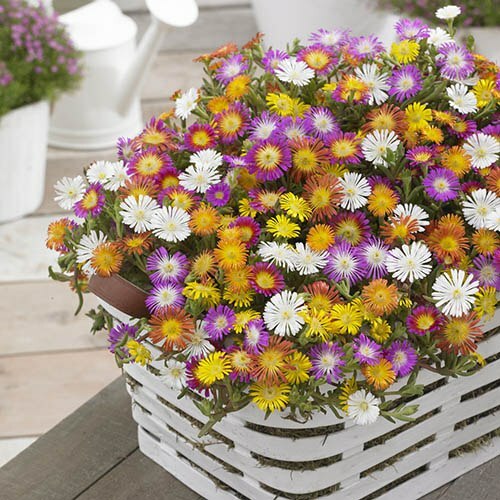 Try something different this season for low-maintenance colour, with our Hardy Delosperma Jewel of Desert colours collection of 3 plants in Orange, Yellow and Violet. Grow in free-draining soil - do not at any point allow plants to sit in water. Wet soil during the winter will most likely kill this plant. Foliage may die back in the winter but grows back the following year. Mulching is recommended for the first winter, and during any unusually cold winters after that. Slowly taper off watering in autumn to decrease water retention in leaves - this may also help to reduce winter damage.